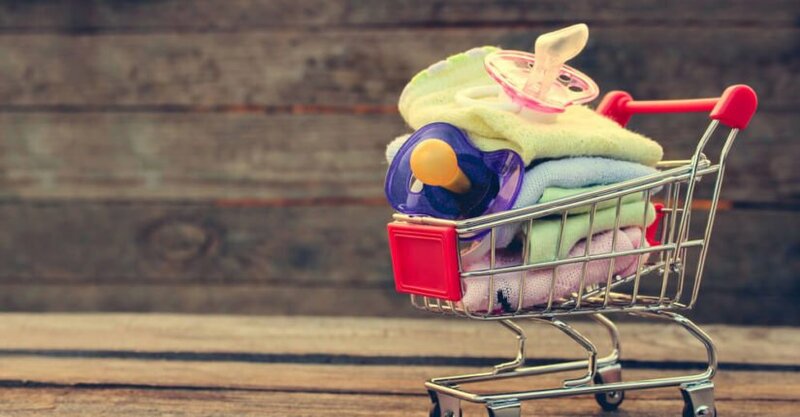 Learn how to sell baby clothes online for cash to these 11 places that will take your kid’s used gear, while also cleaning out your closets. Every parent finds themselves with endless bags full of baby clothes every six months, many that have been worn out, outgrown, or even some with the sales tag still attached. Unless these parents have someone that they can donate directly to, many of these bags full of useable clothes will end up in the trash. We did some research and found that there are many ways to sell baby clothes online for cash! Now you can sell baby products online without the guilt of throwing away perfectly good clothing! Besides most parents are looking for a way to make some extra income here or there, the bills are always piling up so why not sell used clothes? For more ways to earn extra cash check our comprehensive list that shows you 100 + Ways to Earn Extra Money. Now, let’s get back to learning how to sell baby clothes online for cash. It is much easier now that we have complied for you the 11 best places to sell baby clothes. Get ready to learn how to keep your closets cleans and organized with the clothes that actually fit while making extra cash when you sell used baby gear. Facebook Marketplace has been picking up steam lately and, it is quickly becoming a well-known platform where people will sell and buy used items. It is super-fast, user friendly and can be done on your own terms and time. Plus just about half the planet is on it already. One of the best ways to sell baby clothes on Facebook Marketplace is to prep the clothing and make sure you present it in the best light. Find a clean and well-lite table in your home and one by one layout the pieces in order to take attractive pictures. Remember that you want your outfits to look clean and pressed if you have any hopes to sell used baby gear. You can even categorize things, for example place five little shirts together and take a picture. To access the marketing place you need to have a normal Facebook Profile. Accessing the Marketplace from your desktop/laptop, you will find it on the left side and you will see the Marketplace link. Click the Marketplace link and then click on “selling”, and then go ahead and click “sell something” and upload the pictures, price your items and if you want describe the items. Market research suggest that a description with a personal story has a higher chance of selling. Just don’t make it too personal! Mention the brand, if they are brand new or used. You can add your preferred method to deliver these items, which might include physical pick-up, drop–off, or mail. The benefit of using Facebook Marketplace is that it sorts the searches by location and it will display to people in your area the items. This makes pick up or delivery really easy. You might also get an opportunity to meet a new friend in the process. Communication with the potential buyers is super quick through Facebook Messenger. It is definitely worth listing a few items here and see the type of response you get. It might become your preferred channel for sales. For more ideas on generating money from things you are no longer using check out Thrift Store Flipping: 31 Best Things to Buy and Sell for Profit. Everyone goes on eBay. It is a huge channel for sellers and resellers. With over 170 million active byers, eBay makes it high on our list of the 11 places to sell baby clothes online for cash. Since eBay has the benefit of bidding on items, it is important to get everything looking fresh and new. In other words, give all your baby gear a quick ironing. People generally prefer using the eBay app because it is very user-friendly when it comes to taking pictures and uploading them straight from your phone. What we learned is that on eBay baby clothes have a tendency to go for higher prices than other places making it one of the best way to sell baby clothes. Depending on the item you are selling, we suggest to start the bidding at a low price because this will drive a lot of traffic to your items. Once people start bidding you will see the selling price climb which is great for you. Timing also matters when selling baby items. We noticed that if you list your items on a Thursday night, and run the listing for 10 days you tend to have the best results. This gives you two full weekends, which is a huge advantage as most parents are online looking over the weekend. When it comes to shipping we heard from a lot of professional eBay sellers that long and skinny packages are cheaper to ship. We also found a similar service to eBay and can help you declutter more than just baby clothes.Visit Decluttr and begin listing any other items you no longer need to bring in extra cash. An online portal available in the US and Canada, they buy clothing which includes costumes, dancewear, outer gear, sleepwear and anything else that can be worn! Once Upon a Child is an excellent place to sell consignment baby gear online, but they also buy footwear, toys, and even furniture. They do have a list of favorite brands but it is not limiting to that. To see the brands you can visit their website. To use their services, make sure your clothes are gently used, which means no holes, stains or faded colors. They also prefer if the clothes are current, which means that they came out over the past few years. They generally pay between 30% – 50% of what they sell the item for. They are not your average store that offers consignment baby gear online, as they do quality control on every item you turn in. From our research we gathered that they have stores nationwide, and you do have to take the clothes physically at the store for inspection. The benefit is that you get paid right then, leaving them to sell baby clothes online for cash. So unlike other options, you get money immediately. If you are looking for more ideas to bring in more cash click here to check out 71 side business ideas that will help you earn a significant amount. Another great reseller that offers consignment baby gear online is My Kid’s Threads. My Kid’s Threads focuses on new and gently used designer baby clothing. The process is pretty straight forward and on their website they list all the steps under the “How it Works” link. You first request a bag online which they ship to you. Then go ahead and clean your kid’s closet of all clothing that no longer fits. Wash and iron the clothing if needed, pack the bag they send you, and drop it off at your local UPS. A big perk is that shipping is free so you don’t have to spend any money in the process. Once they receive the bag they inspect and prepare a list of all the items. When it comes to cashing-in, you have a couple of options, you can choose to get 50% of the profits if you want to redeem the money in their store, or 40% of the revenue if you want to receive cash in your PayPal account. Much like the previous option, they sell used baby gear outside of just clothing. Kidizen is the best place to sell baby clothes if you want an easy and helpful solution to your dwindling closet space. The first thing you have to do with Kidizen is to create an online account. Once you create an account, which literary takes five seconds, you go ahead and click on “SELL” which redirects you to begin listing your items. They make the process extremely easy, you will need to take a picture of the items you are selling, and for each item you make a new listing. You upload the picture and then proceed to fill in the details, which include size, category, gender and other relevant information so buyers can sort through the website with ease. At the bottom of the listing, when you place your price, it will actually let you know how much you get to keep. In the listing price make sure you include your shipping cost. If you are new to online selling, their platform even makes suggestions for pricing which can help you price your items correctly. KidtoKid is a great platform to sell baby products online. Much like our previous mention Once Upon a Child, you need to gather all clothing you no longer need and make sure it is clean and ready to sell. These guys will buy maternity clothes, toys and baby gear. You will have to drop it off at one of their locations where you get cash upon delivery. KidtoKid stores are independently owned and might have slightly different policies or hours. For that we recommend you call ahead before driving to one. KidtoKid offers tips on their website to help you get more cash for your items. Once you arrive at the store the process can take anywhere from 20 – 30 minutes to complete. If they happen to reject some of your items, we suggest to consider donating them to a charity. Swoondle Society may not be the best place to sell baby clothes, because they don’t purchase clothes from you, however if your little one is growing, then you may like their service as they offer a swapping platform. Compared to other platform that split the profits with you at best, these guys have an annual subscription fee and you get to trade items. Swoondle Society is a good fit for you if you are looking to replenish your child’s closet with new items. Their value as stated on their website is that shopping by swapping is 80% cheaper than other second-hand buying options and 95% cheaper than buying retail. To get started with Swoondle Society you first need to choose a plan and receive a welcome kit. You then send any items you want to trade, they receive your shipment, your bag is processed and you get to shop / trade on their platform. When you request a bag, it generally takes 3 business days to receive it which gives you some time to locate the items you want to send, clean and iron them so they are ready for the buyer. To get the best value, they suggest you send in items that were originally $20 or more in retail value. Once they receive your items, you get a confirmation that you are ready to redeem your points within 5 business days. For mommies looking for extra ways to bring in money, or even replace their full-time job, click here to learn about 15 companies you can sell beauty products for and earn a full-time living. Schoola is not just another platform to resell clothing, but offers a charitable angle to selling consignment baby gear online. Schoola was founded by a mom and an ex-teacher with a mission to equip schools with much needed supplies. On Schoola you can find anything from clothing to accessories for babies, kids, junior and women. They even have special sections for maternity, petite or plus-size. When you buy from them, 40% of all proceeds are donated to a school of your choosing. So far over 30 000 have benefited from Schoola donations. To sell to them and make some extra cash, you need to package any new or gently used clothes your children no longer need, add the pre-paid label and mail it to them. They prefer clothes with original value of $30 of higher. Due to their charitable roots, they do not give the best payouts but if you are looking to make an impact as well as collect some cash this might be a good platform for you. You generally receive $2 for the average online consignment or give $7.21 to a school of your choosing. Poshmark is one of the first online consignment portals. It is filled with an amazing collection of children’s clothing and it is the best way to sell baby clothes. You can download their app which makes it extremely easy to do the whole process. You simply take a picture, and you can upload your entire collection of used items you want to sell in a matter of minutes. They also have pre-paid labels that they provide all their sellers with, and cash goes into your account as soon as your items are delivered. These options definitely gets a 5-star rating when it comes to how user friendly the process is. Their commissions are very reasonable. For every item under $15 they take $2.95. For sales over $15 they take 20%. With Poshmark shipping is paid by the buyer and they have a variety of options, including expedited shipping at a flat rate of $6.49. We suggest you give this one a try. Now if you managed to wash, iron and package all the clothes and the kids are still asleep you can maximize your free time by learning how to take surveys online and earn an additional $1000 per month by taking surveys at home! These guys are branded as an environmentally responsible place to find consignment baby gear online. All their shipping bags and other supplies are made from 100% recycled materials. The bags are provided to you upon request. All you have to do is filled them with clean, new or gently used clothes and ship it back to them for free. They have a good pay out, where you make 60% of the sale price from your items. Josie’s Friends, LLC is not only big on environment and recycling, but also have a very generous fundraising platform where you have the option to donate 50% of your earnings to a charity of your choice. This one is completely owned and operated by moms and their mission is to support the less fortunate children around the world through their consignment online platform. There are way too many “feel good” reasons to not give this one a try. We are closing our research with ThredUP, which is the world’s largest marketplace to sell baby products online. The reality is, not only children but adults outgrow a lot of their clothes, so why not cash out on those as well? Just like most platforms in this category, you will get a free bag from them, find what clothes you want to sell, place them in the bag and mail the bag in for free. They do focus on “like-new” items or even never worn before items. ThredUP has a cool feature, the Clothing Calculator which allows you to estimate how much your clothing is worth. What is really cool with ThredUP is that they will buy your clothes from you, so you do not have to wait for a client to buy it before you make money. They pay up to 80% of the resale value and you can get that money in store credit or cash. If you prefer to use your phone instead of your laptop, they do have a super user-friendly app. Because they do accept adult clothes, if your little one has grown up and left the nest, then you may even consider the option of turning their former room into an Airbnb and make even more cash from their departure! Click here to find out more about Airbnb, and sign up to become a host! If none of the above options work for you, you can keep searching, and you will likely come across some more platforms such as SnobSwap, Crossroads, Swap.com, Mercari, or even build your own website if you get really serious about cashing in on used clothing and other items. Also make sure to check out 17 places online where you can sell clothes for cash for more ideas. No matter what platform you decide to use, we are confident that now you can make extra cash and recycle your kid’s clothes with ease. If you’ve found another way to sell used baby gear please feel free to leave a comment!